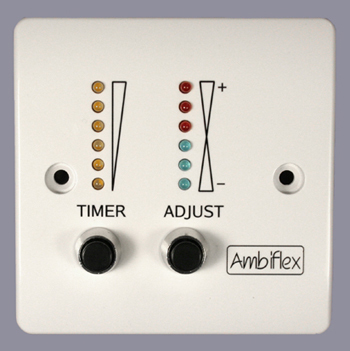 The Ambiflex EM200B is a universal override unit communicating with its host system using the Modbus-RTU RS485 protocol. Two timers in the same compact package. Each timer operates independently with its own timing range selection and BMS control points. Click here for EM200B Type 1 datasheet (PDF). Override timer plus analogue adjust point in a single compact package. Each section operates independently with its own range settings and BMS control points. Click here for EM200B Type 2 datasheet (PDF).